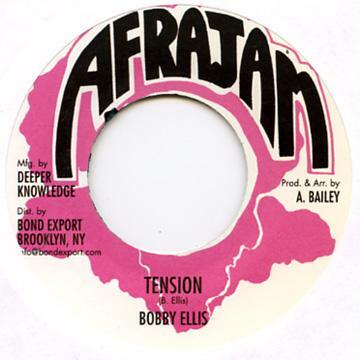 Deeper Knowledge presents five killer roots 7"s from producer Alphonso Bailey, one of the great unsung producers of the 1970s. Though not quite a reggae household name, Bailey was fully in the mix on the Kingston scene in the '70s, as a producer, record store owner, and for a time, also working as a plater at Dynamic Sounds. His output over his few labels (Globe International, World Champ, Afrajam, Free Slaves) was relatively small but choice, often utilizing killer riddims hand picked from some of his cohorts of the day. So we present five of his best tunes. "Rat and Bat" is on Yabby You's "Conquering Lion" riddim, and featuring a funny spoken intro between Devon & Bailey. "Famine Time" and "Follow Fashion" are both on the Upsetters' immortal "Fever" rhythm, and each tune has its own unique dub. Bobby Ellis & Descant's 45 is a killer militant horns instrumental in the classic Channel 1/Revolutionaries mold, with a dubbed out version on the B-side. Lastly, Forces tune is a classic one-away, awesome heavy roots vibes from the turn of the '70s into the '80s. No.20 at Total Ranking on Dec 17, 2011. No.1 at Genre Ranking on Dec 20, 2011. No.1 at Format Ranking on Dec 20, 2011.